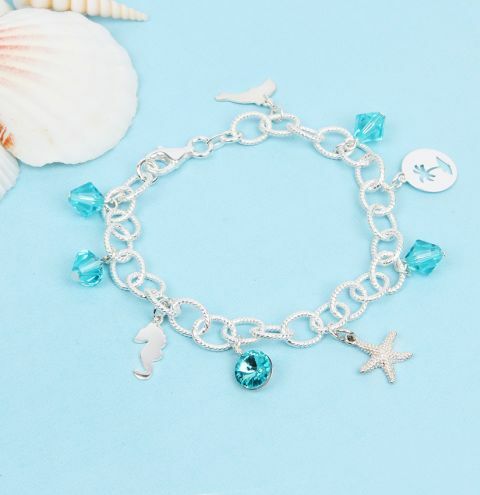 Make a pretty charm bracelet for summer using Swarovski crystal bicones and sterling silver charms! Please note - the original dolphin charm in this design is now out of stock due to high demand. Insert a headpin through a Swarovski crystal bicone and bend and trim the eyepin to make a loop. Repeat this step for as many beads as you would like to use on your bracelet design. Connect the Swarovski beads to the chain using a jumpring through the loops. Spread them evenly along the chain. Decide where you would like your charms to sit and connect them to the chain with jumprings. Glue the Swarovski crystal into the setting then glue in the crystal and allow to dry.